Page added in December 2005. 1204: the Byzantine Empire is parcelled out among the leaders of the Fourth Crusade after they conquer Constantinople, but the small Aegean islands (including Schiro) soon fall directly or indirectly into the hands of Venice: Schiro was ruled by the Ghisi and the Tiepolo, both families of Venetian merchants. 1390 ca. the Turks seize Schiro and later on return the island to the often nominal rule of the reconstituted Byzantine Empire. 1453: the Turks seize Constantinople: Schiro becomes a Venetian possession. 1538: Khayr al Din (Barbarossa - red beard), corsair and admiral of the Turkish fleet, seizes Schiro. "Calchas, the priest of Apollo, had foretold that Troy could not be taken without the aid of young Achilles, the seventh son of Peleus and Thetys. ... now Thetys knew that her son would never return from Troy if he joined the expedition, since he was fated either to gain glory there and die early, or to live a long but inglorious life at home. She disguised him as a girl, and entrusted him to Lycomedes, king of Scyros, in whose palace he lived under the name of Cercysera, Aissa, or Pyrrha; and had an intrigue with Lycomedes's daughter Deidameia by whom he became the father of Pyrrhus, later called Neoptolemus. Odysseus, Nestor, and Ajax were sent to fetch Achilles from Scyros, where he was rumoured to be hidden, Lycomedes let them search the palace, and they might never have detected Achilles, had not Odysseus laid a pile of gifts - for the most part jewels, girdles, embroidered dresses and such - in the hall, and asked the court-ladies to take their choice. Then Odysseus ordered a sudden trumpet-blast and clash of arms to sound outside the palace and, sure enough, one of the girls stripped herself to the waist and seized the shield and spear which he had included among the gifts. It was Achilles, who now promised to lead his Myrmidons to Troy." (Robert Graves - The Greek Myths - 160). 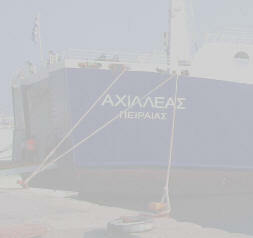 This introduction explains why the ferry for Schiro is named AXILLEAS (you can see it in the image used as background for this page). A modern Thetys would surely choose Schiro even today if she wished to protect her children from the dangers of modern life. 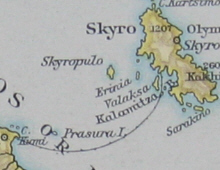 The island is (relatively) far from everything: it can only be reached via a daily ferry from Kimi, a port on the eastern coast of Negroponte (Evià or Euboea). Thetys chose Schiro also because the town was hidden by a high rock and it was not visible from the sea (today this is only partially true). Cars and buses reach only the lower (modern) part of the town. A long walk through winding streets leads to the acropolis, where once Lycomedes had his palace and upon which the Byzantines and the Venetians built a fortress. In addition to donkeys which are widely used in many old Greek locations (see Nasso and Malvasia) the inhabitants of Schiro make use of very small horses, a unique breed of semi-wild horses which live in the mountainous southern part of the island. The small size is the result of a process of adaptation to the limited vegetation of the island. In 2001 an earthquake caused a landslide which crushed a section of the fortress. The monastery of Agios Georgios, although damaged, was spared and now it hangs on the rock as if it is stuck into it. The fortified tower which protected the entrance to the fortress is embellished by a medieval statue portraying a beast, which with some openness of mind can be labelled as a lion, a symbol of the Venetians who most likely built the tower. The fortress offers fine views over the coastline, not yet altered by those large buildings and facilities which, for example, mar Schiatto. The anonymous appearance of today's Kimi hides its very ancient past. It is located on a low plateau at the eastern tip of Negroponte. In the VIIIth century BC settlers from Ancient Kimi founded Cuma in today's Gulf of Naples. Cuma soon became one of the richest colonies in what the Romans called Magna Grecia, the southern part of the Italian peninsula and the eastern part of Sicily, which both were part of the Greek world. A round ruin having the appearance of a tower is actually a former wind mill.